As far as I can figure, Ken Elkinson is one of those composers who has a whole bunch of stuff dancing in his head and he just needs to let it out sometimes—in huge chunks. 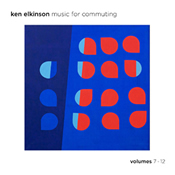 In 2011 he gave us the first six volumes of Music for Commuting, followed that up in 2013 with two volumes of Music for Telecommuting, and now drops another six volumes of the first on us. (To say nothing of the 14 albums in between…) Music for Commuting Vols. 7-12 is 60 tracks of Elkinson’s soft, light music, the kind of stuff you’ll use to underscore your day. With this collection, I find myself drawn more to Elkinson’s ambient-style forays than to his poppier, rhythmic ones. Problem being, the underlying style doesn’t seem to change up that much. The overall arrangement is soft-edged keyboards and breathy pads paired up with chime-like tones that bounce about charmingly. In places it lands with a bit too much of a leftover Ray Lynch vibe (lookin’ at you, “Data Packet”)—which, in doses, is not a bad thing. I have always liked Ray Lynch’s work…in doses. So while the retro ping can be fun, here (and, again, we’re talking about 60 tracks) it happens too often for my tastes. When Elkinson plays in quieter fields, it works very well. “Icicle Rain” is a perfect combination of sighing chords, that hushed organ sound, and a gently percolating accent to round out the imagery. “Desert Valley, Wind” has caught my ear consistently over my several review listens. It’s got a slight air of melancholy crafted in long-held chords and a melody that sings almost to itself beneath, on what sounds like a melodica. And while “Loosely Held Firecracker” sounds like it should be more uptempo, it’s a rich ambient-style drift specked with twinkling electronics. “Penumbra” makes the most of big chords and a rich string sound as it spirals upward. For me, Music for Commuting has worked best as part of a bigger shuffle. I like Elkinson’s music. It can be playful, it can be emotional. It’s familiar, usually in a good way, and it’s easy on the ears. Big batches of music like this need to be broken up, anyhow, to avoid revealing its underlying sameness. Blended in, these light, bright pieces pop up as aural palate cleansers and mood adjusters. Give it a listen, and see if it has a place dovetailed into your own queue. Available from Ken Elkinson’s web site.